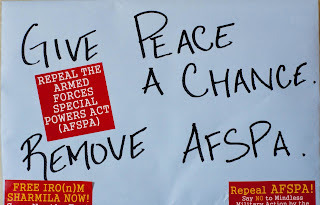 Guwahati, Jun 1 : The Tripura government’s decision to withdraw AFSPA has resonated in Manipur one of the most troubled-hit states in the North-East. The AFSPA withdrawal has sent a message of confidence and hope to the people of Manipur in their epic fight against Armed Force Special Power Act (AFSPA). The supporters of Irom Sharmila Chanu, who is on fast since 2000 for total repeal of the draconian law, have once again vowed to launch a massive anti-AFSPA protest in the state and other parts of the North-East. “This start must become dynamic very soon and governments must try to repeal it from everywhere in the North-East. We also believe that by breaking this inertia, there is a signal of something positive. A start was awaited. We will hit the streets asking for total repeal of the draconian act,” the Save Sharmila Solidarity Campaign stated in a statement.